Rheem Valley Automotive established in 1998 is your neighborhood premier auto repair service. All our mechanics are ASE Certified and have the experience to handle all your automotive repair and maintenance needs. Our experienced mechanics will keep your vehicle running in top condition. 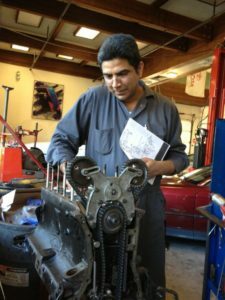 Ravi Singh, owner of Rheem Valley Automotive, is a master mechanic and has has the ability to fix all kind of automobiles correctly and on time. Rheem Valley Automotive prides itself in providing car owners with a one-stop shop for computerized diagnostic and repairs for a variety of Automobiles, trucks, SUVs, Mini-Vans, Hybrids, as well as classic cars. We also combine old-fashioned Values with the very latest in auto repair technology. Most importantly, we are STAR SMOG (check and repair) station. We are also a state certified Brake & Lamp adjustment station. Customer satisfaction without any exception is our highest priority. We've been in business taking care of cars and car owners for 15+ years and have the best-in-class training and services. We are proud to have serve generations of repeat customers; additionally, we are certified, registered, licensed and insured to service all of your automotive needs! From engine repair to tires and brakes, we've got you covered! In most cases, we offer same day service, convenient hours. For our valued customers we provide local pickup and drop off service and have a loaner available. Rheem Valley Automotive is locally owned and operated, we understand the importance to have a safe vehicle. Our mechanics are honest, hard-working, plain and simple. In addition, we are always personable with our customers as well as honest and upfront about matters relating to your vehicle. Let us handle your car needs today. You won't find a better level of service at a more affordable price!